Speaking at the recent Russia-EU summit, Russian President Vladimir Putin voiced the idea of creating a free trade zone between the EU and the Customs Union, which currently includes Russia, Kazakhstan, and Belarus. This proposal has major implications for two of Russia's most important foreign policy priorities. The first of these priorities is for Russia to achieve equal status with the West in international politics. Ever since Putin was elected president for the first time, in 2000, the strategic goal of Russian diplomacy has been for the country to be considered an equal to its transatlantic partners. The Kremlin believes that Western countries are too prone to meddling in Russian internal affairs; that they are openly trying to stymie Russia's policies in the CIS states; and that they are working against Russia’s trade and economic interests. According to this train of thought, this is happening because during the first decade after the fall of the Soviet Union, Russia accepted the role of a junior partner in its relations with the West. The second priority is for Russia and its allies to become one of the major players in today’s multipolar world through a close alliance of the former Soviet states. Russia is investing huge political and economic capital in building the Eurasian Union, and it regards any delays in the already approved schedule of integration as unacceptable. The Russian vision for the future political and economic system for the Russian-led Eurasian Economic Union is one of the six to eight major actors in global affairs. The proposal made by President Putin in Brussels on Jan. 28 can be regarded as groundbreaking because it requires a certain revision of these two foreign policy priorities. Technically speaking, the initiative to establish a free trade zone stretching from the Atlantic to the Pacific is not in Russia’s own best interests. Most economists would agree with the dictum formulated by Otto von Bismarck in the 19th century: "Free trade is a weapon of the strongest nation.” The European Union’s economic potential is six times greater than Russia’s; its foreign trade is five and a half times the Russian figure. As a result, any union of the EU and the Customs Union would not be a marriage of equals. A genuine free trade area would merely perpetuate the current trade structure between the EU and Russia (plus its allies): natural resources in exchange for technology. Russia is gradually formulating its own definition of “free trade” and its own ideas as to what kind of measures are acceptable in running a free trade zone. The country’s accession to the WTO has so far failed to liberalize its free trade regime, and the Russian foreign trade system remains one of the most restrictive in Europe. In addition, there is a clear global trend under way towards greater protectionism. The Kremlin probably believes that at the early stages, a free trade area will not prevent it from micro-managing the Russian economy and foreign trade as it sees fit, ignoring some of the established international rules of free trade. 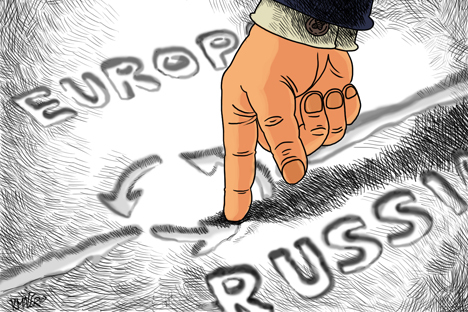 European integration is the greatest challenge to modern Russia. This challenge can be viewed as an incentive to reform the political system and modernize the economy. Alternatively, it can be viewed as a threat that the government must counter through any means. Since the announcement of the Partnership for Modernization program by Russia and the EU in 2010, Moscow has made it clear to its partners that it does not rule out the possibility of a more positive reaction to the challenges posed by the EU. In theory, there is a strong temptation for Russia to turn its back on Europe and pursue a free trade zone with China instead. In fact, some of the infrastructure required for the implementation of such an area has already been laid down in the form of the Shanghai Cooperation Organization, which has been languishing for lack of any real cause for almost 10 years. The Russian initiative on establishing a free trade area with the EU will undoubtedly lead to a deterioration in its relations with China. This means that in the long term, Russia prefers to remain part of the greater transatlantic community. In return for making that strategic choice, the Kremlin is asking a justifiably high price: It wants Russia to be recognized as one of the main actors in the global political and economic system. It also wants equal rights for the Customs Union and the EU. Essentially, Moscow’s proposal on establishing a free trade zone with the EU is a political statement rather than an economic one. The Kremlin has made it clear that it is ready to offer the EU equal partnership, with a clear prospect of economic integration between the two. The ball is now in Brussels' court; the EU must decide whether to accept or decline that offer. Stanislav Tkachenko is the head of the diplomacy program at the international relations department at St. Petersburg State University.